Samuel Bianchini et Erik Verhagen avec la collaboration de Nathalie Delbard et Larisa Dryansky. Cambridge / London, éd. The MIT Press, 2016. How are we to understand works of art that are realized with viewers’ physical involvement? How are we to analyze a relationship between a work of art and its audience that is rooted in an experience both aesthetic and physical when “user experience” is a central concern of a society held in the grip of omnipresent interactivity? Between two seemingly opposed modes, contemplation and use, this book offers a third option: that of “practicable” works, made for and of audience action. Today, these works often use digital technologies, but artists have created participatory works since the mid-twentieth century. In this volume, critics, writers, and artists provide diverse perspectives on this kind of “practicable” art, discussing and documenting a wide variety of works from recent decades. 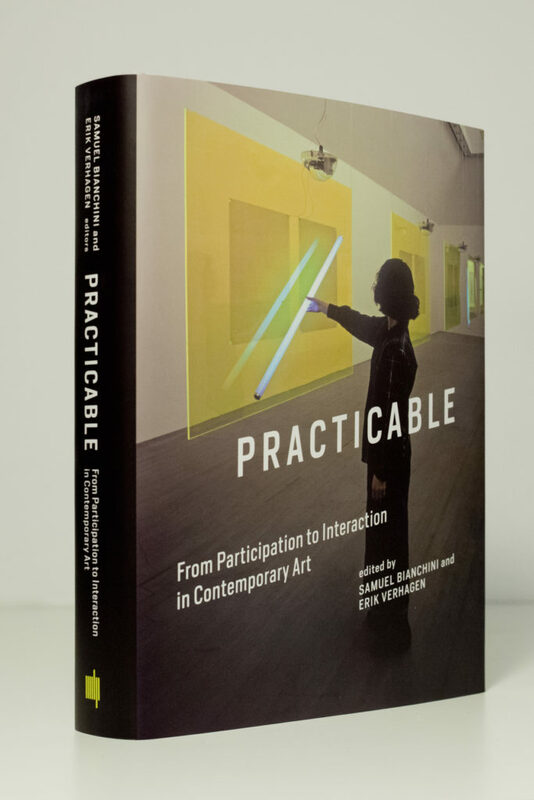 Practicable returns to the mainstays of contemporary art from the 1950s to the present, examining artistic practices that integrate the most forward-looking technologies, disregarding the false division between artworks that are technologically mediated and those that are not. Practicable proposes a historical framework to examine art movements and tendencies that incorporate participatory strategies, drawing on the perspectives of the humanities and sciences. It investigates performance and exhibition, as well as key works by artists including Marina Abramović, Janet Cardiff, Lygia Clark, Piotr Kowalski, Robert Morris, David Rokeby, and Krzysztof Wodiczko, and features interviews with such leading artists and theoreticians as Matt Adams of Blast Theory, Claire Bishop, Nicolas Bourriaud, Thomas Hirschhorn, Bruno Latour, Seiko Mikami, and Franz Erhard Walther.